For a smooth effect you want to blend each color lightly into each other. The red and orange will blend to a slight pink.. the yellow and green will make a lighter green.. or you can just skip the green and blend the blue and yellow to make a slight green. It helps if you have colorful eyeliners and start with those to guide your shadow. 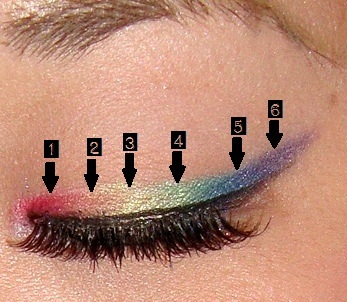 Also, use a white or another light pencil liner to outline the shape you want your eyeliner. I love how this turned out. I can never do this.